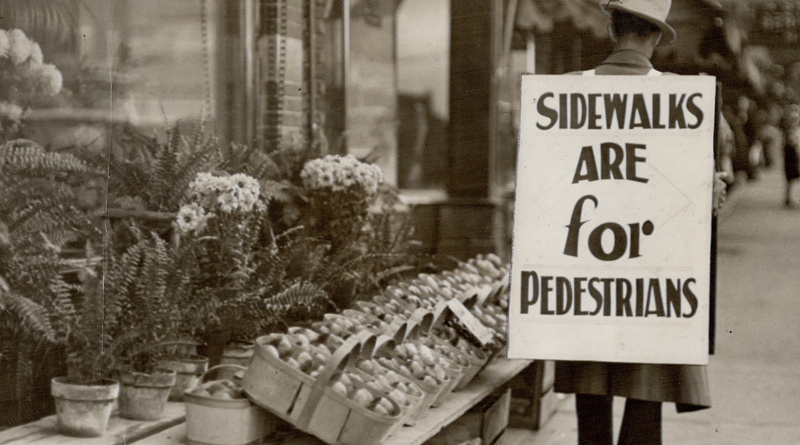 A sandwich man protests the sale of fruit from the sidewalk along Danforth, October 1934. Image: Toronto Star / Toronto Public Library, Baldwin Collection, Item TSPA 0113093f. ’twas ever thus. So long as we’ve gathered into cities, there have been disputes – both major and minor – over the appropriate and proportionate use of public space. Sometimes, such as our perennial arguments over the patios installed on Elgin street here in Ottawa during the summer months, it’s an entirely legitimate exercise in negotiating the use of space. Other times, such as the pitched battles between restaurants and food trucks, it’s more a matter protecting revenues by limiting the range of choices in the immediate area. In the case of the photo above, it was more of the former, but with some drops of the latter added to the mix. 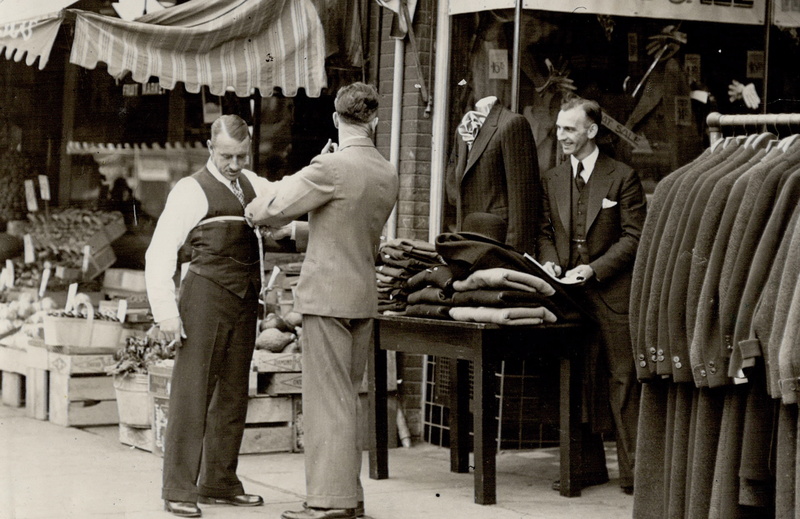 In October 1934, the Danforth Business Men’s Association, East Section1east of Greenwood for 1.5 miles. That’s roughly Greenwood to Main, a bit less than today’s Danny/Danforth Mosiac BIA, which runs from Jones. orchestrated a rather creative protest. 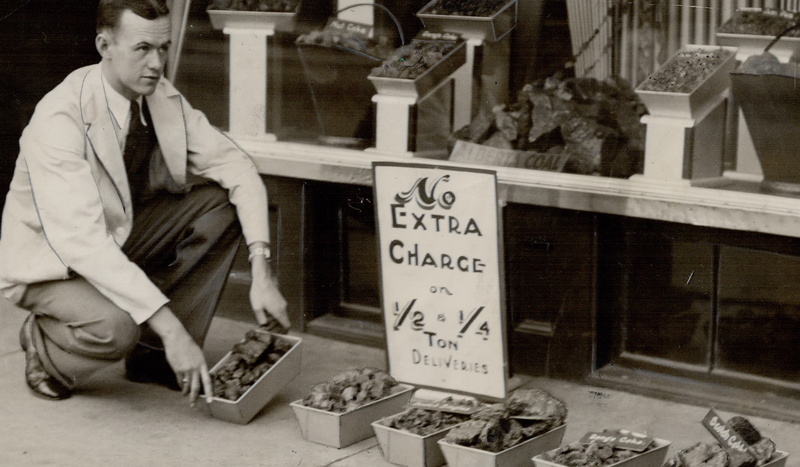 In opposition to the “scourge” of fruit stores selling their wares outside on the sidewalk, the Association and the businesses it represented took to the street. In this case, somewhat more literally than one would expect. Rather than limit their action to formal protest, as the sandwich man above illustrates, they decided to join the fruiters on the sidewalk themselves in hopes that it would help to demonstrate the congestion that they felt was being caused. Reportedly, the reason was less about the presence of the fruit stands and more about their common violation of the bylaw, which called for a maximum of eighteen inches of sidewalk space to be used to display merchandise.2”Merchants Move to Walks Giving Danforth Paris Air,” Toronto Star, October 22, 1934, 1; “Danforth Goes Parisian – Sidewalk Business Brisk,” Toronto Star, October 22, 1934, Second Edition, 1. An outdoor patio – even on a chilly October – isn’t so silly. That wasn’t the intention of the DBMA, however. Image: Toronto Star / Toronto Public Library, Baldwin Collection, Item TSPA 0113096f. Interestingly, at least for some, the stunt most likely backfired. The Star more than once reported that Danforth had taken on a “Parisian” flair and that business in the open air was actually quite good. It does not appear that locals piled on to the street car or stayed home. Rather than make things seem silly, it seems that the business association probably hit on a better idea – though they didn’t seem to believe so and continued to seek the attention of the local Magistrate.3Archibald Lampman, “Trade is Brisk on Danforth as Merchants Seek ‘Arrest’,” Toronto Star, October 23, 1934, 3. No, it’s not that Archibald Lampman . He died in 1899. Made to measure, on the sidewalk. No entirely ridiculous in hindsight. Image: Toronto Star / Toronto Public Library, Baldwin Collection, Item TSPA 0113095f. In what was most likely a cause of more frustration,4”Danforth Merchants Say Magistrates Lax,” Toronto Star, October 25, 1934, 11. the local by-law officer, Inspector Alexander, proved reluctant to enforce the bylaws in the face of the protest: “I’m not going to put my head into a noose.”5Ibid. 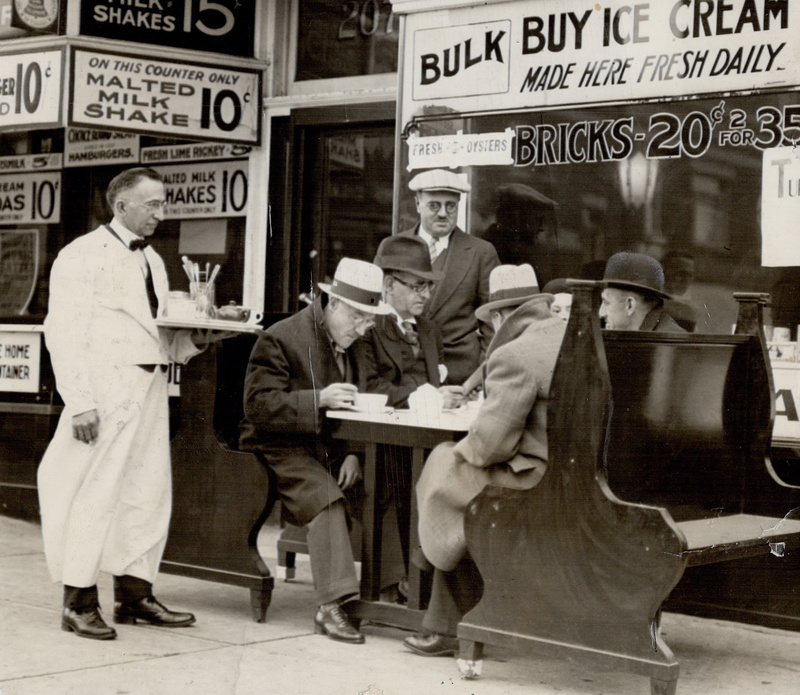 Without another tactic planned, the organization’s businesses continued to bring their wares on to the sidewalk through the end of October.6Toronto Star, October 27, 1934, 11. Coal samples too. Image: Toronto Star / Toronto Public Library, Baldwin Collection, Item TSPA 0113097f. In spite of what may be considered a failure of sorts, the DBMA did get the attention of the city. On November 2, the City’s Works Committee committed to make a decision about sidewalk displays for all vendors in two weeks. The association, for its own part, maintained its protest against any sidewalk displays.7”Decision is Shelved on Sidewalk Display,” Toronto Star, November 2, 1934, 2. Clearly less interested in banning them outright, the City continued to deliberate over the issue into the new year.8”Danforth Sidewalk Sale Still ‘In Air,” Toronto Star, November 27, 1934, 5. Following a delay of several months, the City decided in the end not to ban them and instead settled on the stepping up of enforcement for the existing bylaw.9”Council Won’t Ban Sidewalk Displays,” Toronto Star, March 4, 1935, 4. Although City Solicitor Colquhoun, in his long-delayed report concluded that the displays that were more than eighteen inches were indeed “not legal”, unless they obstructed traffic, the enforcement was likely difficult and not the preferred course of action.10”Sidewalk Rules Not Legal, Says Rule,” Toronto Star, May 9. 1935, 43. For the time being, the issue was left to lay. Of course, the management of the public realm is always up for negotiation and renegotiation. This goes double when commercial activities are in the mix. 1. ↥ east of Greenwood for 1.5 miles. That’s roughly Greenwood to Main, a bit less than today’s Danny/Danforth Mosiac BIA, which runs from Jones. 2. ↥ ”Merchants Move to Walks Giving Danforth Paris Air,” Toronto Star, October 22, 1934, 1; “Danforth Goes Parisian – Sidewalk Business Brisk,” Toronto Star, October 22, 1934, Second Edition, 1. 3. ↥ Archibald Lampman, “Trade is Brisk on Danforth as Merchants Seek ‘Arrest’,” Toronto Star, October 23, 1934, 3. No, it’s not that Archibald Lampman . He died in 1899. 4. ↥ ”Danforth Merchants Say Magistrates Lax,” Toronto Star, October 25, 1934, 11. 6. ↥ Toronto Star, October 27, 1934, 11. 7. ↥ ”Decision is Shelved on Sidewalk Display,” Toronto Star, November 2, 1934, 2. 8. ↥ ”Danforth Sidewalk Sale Still ‘In Air,” Toronto Star, November 27, 1934, 5. 9. ↥ ”Council Won’t Ban Sidewalk Displays,” Toronto Star, March 4, 1935, 4. 10. ↥ ”Sidewalk Rules Not Legal, Says Rule,” Toronto Star, May 9. 1935, 43.